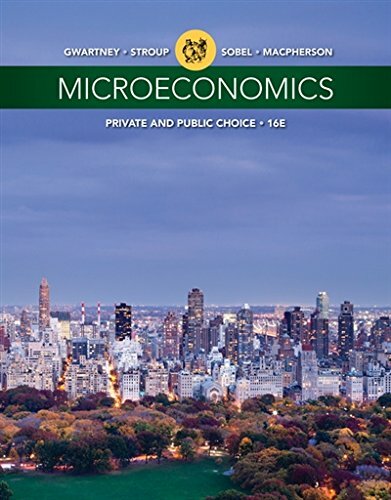 1305506898 -Prepare students to apply microeconomic concepts to the world around them as MICROECONOMICS: PRIVATE AND PUBLIC CHOICE, 16E reflects current economic conditions. This readable book integrates public choice analysis and explains the operation of markets and the political process as well as market failure and government failure. The book emphasizes why it is vital to understand both the market and political processes since approximately 40 percent of national income is allocated through the political process. This book dispels common economic myths and uses the “invisible hand” metaphor to explain economic theory, demonstrating how it works to stimulate the economy. This edition includes Aplia online learning solutions with revised questions, accessibility on mobile devices, improved graphing, and a new interactive eReader with videos and graphing tutorials.